:While the murder of his wife devastated Anthony Thompson, he and three other relatives of victims chose to privately and publicly forgive the shooter. Years later, the church and community still struggle to understand the family members' deliberate choice to forgive the racist murderer. But as Charlestonians have witnessed these incredible acts of forgiveness, something significant has happened to the community--black and white leaders and residents have united, coming together peaceably and even showing acts of selfless love. 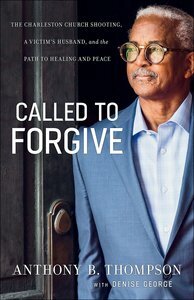 About "Called to Forgive: The Charleston Church Shooting, a Victim's Husband, and the Path to Healing and Peace"